Celebration special wishes are best delivered by gifting this Simply Stunning Premium Arrangement of Flowers in a Basket to your family and friends. This captivating Bouquet is made of beautiful Mixed Flowers such as 3 Orchids, 4 Roses and 10 Gerberas. 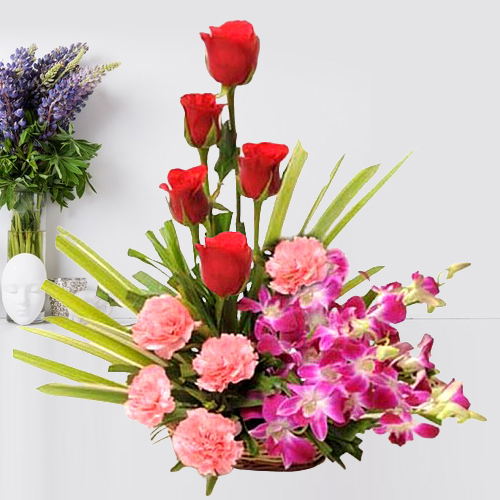 Flowers Delivery Alwar, Send sweets Vishakhapatnam, Wedding Cake Amritsar, Diwali Mithai Pallakad, Send Flowers and Gifts to Mangalore, Online Shop Belapur, Flower to Taran Taran, New Year Flowers Shimoga , Fresh Fruits Ankleshwar, Send Gift Hazira, Dry Fruits to Rohtak, Birthday Delivery Puri, Sending to Mhow, Flower shop Karaikal, Gurgaon Online Cake Delivery.